Sachi Hose captained the VALERIE H as Howard Hose manned their 130-class Penn International reel. The big marlin ate an 8-lb aku they'd used for bait. 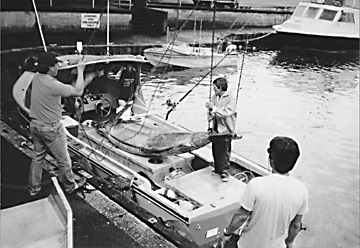 The marlin was stored at Suisan Fish Auction for two days before being weighed. When it was placed on the scales, it weighed 999 lbs but was clearly over 1,000 lbs upon capture and even registered scales have an accepted variance of 1 lb at this weight.